Artist Christo will create a temporary sculpture in Hyde Park, titled The Mastaba (Project for London, Hyde Park, Serpentine Lake). Construction on the sculpture begins today, 3 April, and it will float on the Serpentine Lake from 18 June (weather permitting) to 23 September 2018. This will be the artist's first major public, outdoor work in the UK. The temporary sculpture will coincide with an exhibition at the Serpentine Galleries of Christo and Jeanne-Claude’s work (19 June to 9 September 2018), which will include sculptures, drawings, collages and photographs spanning more than 60 years. Both projects draw on Christo and Jeanne-Claude’s history of barrel artworks and will be an unprecedented opportunity for visitors to experience the work of one of the most pioneering artists working today. Christo’s temporary structure, which will be built by a team of experienced engineers, will consist of 7,506 horizontally stacked barrels on a floating platform in Serpentine Lake. It will be 20 meters (65.5 ft) high x 30 meters (90 ft) wide (at the 60° slanted walls) x 40 meters (130 ft) long. The standard 55 gallon barrels, 59 x 88 cm (2 ft x 3 ft), will be specifically fabricated and painted for this sculpture. The sides of the barrels, visible on the top and on the two slanted walls of the sculpture, will be red and white. The ends of the barrels, visible on the two vertical walls, will be different hues of red, blue, and mauve. The sculpture’s floating platform will be made of high-density polyethylene cubes held with weighted anchors. A primary steel scaffolding frame is constructed on top of the platform and the barrels are attached to a scaffold substructure. The total weight will be approximately 500 tons. The footprint of the sculpture will take up approximately 1% of the total surface area of the lake. While some equipment and materials, such as scaffolding, will be rented and then returned, the other materials will be removed and industrially recycled in the UK following the project. The build of the artwork will be managed to ensure there is no damage to the site, including matting and load distribution to prevent surface damage to the Serpentine walkway. No work is being undertaken on grassed areas. All construction materials will be certified as having low environmental impact to preserve the ecosystem of the lake. The artwork also presents an opportunity to enhance the conservation area and associated wildlife of Hyde Park. An Ecological Enhancement Strategy was developed with The Royal Parks, which is in accordance with National and Local planning policy. In addition to ensuring that there will be no negative ecological impact on the lake, the surrounding park or its wildlife, a number of substantial investments will be made in the park as a direct result of the project, including ecological works on the Serpentine Island, the creation of new habitats for birds and bats, litter clearance of the Serpentine Lake and re-treatment of the Phoslock system that protects the lake from algal bloom. The exhibition of Christo and Jeanne-Claude’s work at the Serpentine Gallery (19 June to 9 September 2018) will follow the extended trajectory of their use of barrel forms since 1958, a material chosen initially for its sculptural effect and low cost. Encompassing six decades of the artists’ career through drawings, collages and sculptures relating to temporary works and projects never realised, the exhibition will explore their steadfast commitment to creating forms with barrels for different sites in varying scales across the world. Supported by Bloomberg Philanthropies, the gallery exhibition will offer a historic context to The London Mastaba sculpture situated close by. It will also examine Christo and Jeanne-Claude’s singular ambition to create what will be their most ambitious and monumental sculpture in the Middle East. This will be the first exhibition of the artists’ work in a UK public institution since 1979. 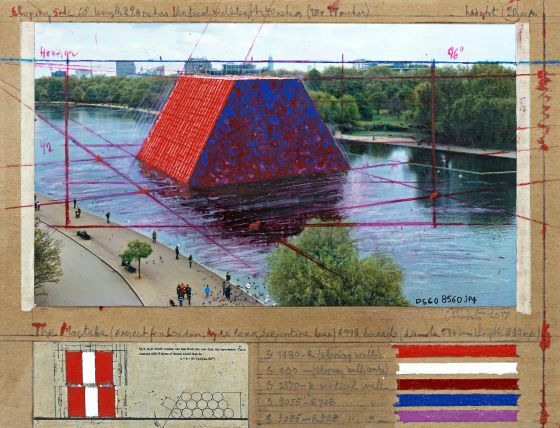 The Mastaba (Project for London, Hyde Park, Serpentine Lake) is being funded by Christo. No public money is used for Christo’s projects and he does not accept sponsorship. Christo would like to thank The Royal Parks and the many community and park partners, including Westminster Council and BlueBird Boats. Visitor information about the sculpture and exhibition will be regularly updated on The Royal Parks and Serpentine Galleries websites.